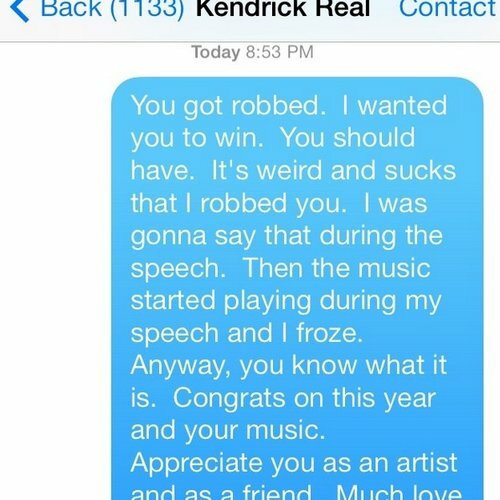 Drake takes aim at Macklemore after his text saying Kendrick was "robbed" at the Grammy Awards. Drake's not usually one for calling out rappers, but in a new interview with Rolling Stone, the Canadian has described the text message Macklemore sent Kendrick Lamar in the wake of his win at the Grammy Awards "wack as f**k". Last month, Macklemore posted a screengrab of the message he sent Kendrick after his album 'The Heist' beat K. Dot's 'Good Kid, M.A.A.D City' to be named the Best Rap Album. He told Kendrick, who had widely been tipped to take home the award, that he should have won and that he was "robbed". Speaking to Rolling Stone, Drake, who was also nominated, said: "I was like, 'You won. Why are you posting your text message? Just chill. Take your W, and if you feel you didn't deserve it, go get better — make better music. It felt cheap. It didn't feel genuine. Why do that? Why feel guilt? You think those guys would pay homage to you if they won?" "This is how the world works: He made a brand of music that appealed to more people than me, Hov, Kanye and Kendrick. Whether people wanna say it's racial, or whether it's just the fact that he tapped into something we can't tap into. That's just how the cards fall. Own your s**t."
"To name just Kendrick? That s**t made me feel funny. No, in that case, you robbed everybody. We all need text messages!"